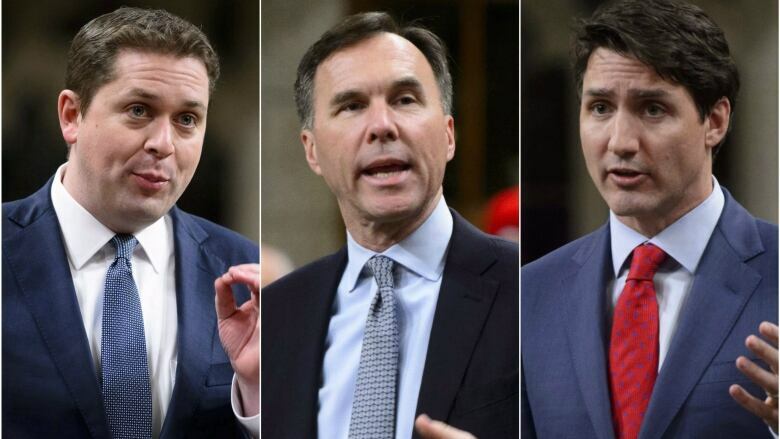 Tuesday's federal budget has drawn a key battle line for the coming federal election, with the Liberals offering a spending plan they say gives Canadians hope for the future as the Conservatives promise a more fiscally prudent platform. Tuesday's federal budget has drawn a key battle line for the coming federal election, with the Liberals offering what they're calling a spending plan that gives Canadians hope for the future as the Conservatives promise a more fiscally prudent platform. Finance Minister Bill Morneau's election-year budget included $22.8 billion in new spending over six years and no timeline for eliminating the deficit. Conservatives claim the budget is nothing more than a costly distraction — an attempt to turn the page on the SNC-Lavalin scandal that has put the Liberals' re-election hopes in jeopardy. Last night, Conservative MPs — outraged over the Liberals' move to shut down a justice committee probe of the SNC-Lavalin affair before former justice minister and attorney general Jody Wilson-Raybould could testify a second time — staged a Commons protest, thumping on their desks and hollering "coverup." Their actions managed to delay and disrupt Morneau's budget speech. The committee was looking into allegations that the Prime Minister's Office inappropriately pressured Wilson-Raybould to allow Quebec engineering firm SNC-Lavalin to avoid criminal prosecution on bribery charges providing it met certain conditions laid out in a remediation agreement. Today, Conservative Leader Andrew Scheer accused the Liberals of trying to draw Canadians' attention away from the scandal through big-ticket spending. In an address to his Conservative caucus, he said Prime Minister Justin Trudeau's government is orchestrating a widespread coverup of a corruption scandal. The government, he said, "cannot be redeemed. It can only be replaced." "We stand ready, Conservatives stand ready, to restore ethical, transparent and accountable government to Canadians," he said. "A government that lives within its means, that leaves more money in your pocket, and lets you get ahead. That is the choice for Canadians come this October. That is what we are prepared to give each and every person in this country." The speech drew rounds of applause from caucus members, who chanted "Andrew! Andrew!" Morneau today began a tour to promote the budget in Toronto, where he delivered a speech and held a question-and-answer session with a business audience. The minister warned again that the Conservative approach to the nation's finances would be to slash programs that help Canadians. In contrast, he said, the Liberal plan is to take steps to reduce the deficit while making significant investments "that give people optimism for the future." "I think it presents a pretty stark choice for people," Morneau said. "Do you make investments that are demonstrably having the kind of impact we want — more people working, more growth in our economy? Or do you go back to a failed idea that the Conservatives put forth four years ago, (to) have cuts and trickle-down economics?" In his Commons speech Tuesday, Morneau said the budget aims to help Canadians worried about retirement security, housing affordability and job skills in a changing labour market. Speaking today at an event to promote the housing affordability measures in Tuesday's budget, Trudeau said the government made a "fundamental promise" to Canadians to make historic investments to grow the middle class. "The choice to invest was a very different choice than the Conservatives were putting forward ... what the Conservatives are still putting forward," he said. "We made the decision to invest because we know that was how to grow the economy and, over the past three years, we've seen that work." The Conservatives have promised to use "every tool in the parliamentary toolkit" to force the government's hand on the SNC-Lavalin affair. Today is a Conservative opposition day, giving them control over the agenda and topic for debate and the power to trigger a marathon rounds of voting. An estimated 257 votes could be called, potentially pushing a voting session into Friday.